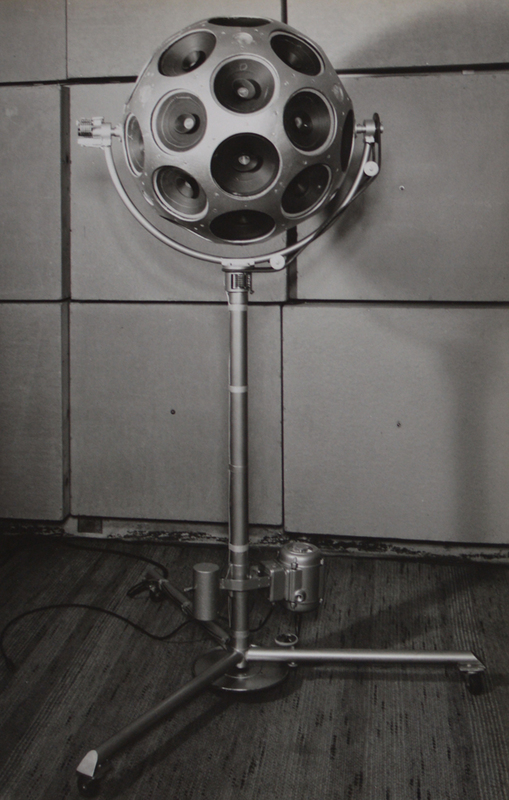 The rotating loudspeaker ball with 32 loudspeakers developed by Hermann Scherchen (source http://www.studiodabbeni.ch/exhibitions/20/hermann-scherchen:-alles-hörbar-machen-i). Through his intensive occupation with recording and reproducing music, the conductor Hermann Scherchen (1891-1966) became aware of the enormous amount of people listening to music through loudspeakers. He was concerned with the difference between the complex sound diffusion during a concert by the whole orchestra and the very poor reproduction of the music through one loudspeaker (at that time sound diffusion was often still mono). Scherchen aimed for a recording to sound as if it were performed in the (acoustic) space, in which it was produced and in which the listener of the recording was present. 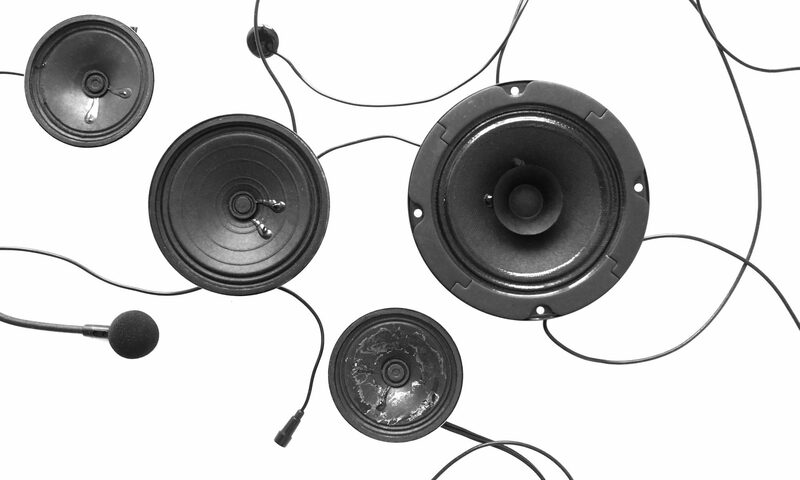 To achieve this, loudspeakers should diffuse sound in such a way, that they “trigger” the acoustics of the space. The recording is not anymore a reproduction of a musical event, which had happened in another space and another time, but the recording now becomes a musical event in itself, sounding as if the instruments are playing in your living room. To achieve this effect, Scherchen invented a rotating loudspeaker ball, or, as it was called by him, “Der aktive Lautsprecher” (the active loudspeaker) or “Nullstrahler” (which could be translated as zero radiator, since it was diffusing sound in all directions). Scherchen looked for an alternative to stereophonic reproduction, which in his opinion could not reproduce the sound perception in a particular space. The rotating loudspeaker ball was developed to distribute the sound in such a way that each member of the public would have the impression to sit inside the “sweet spot”. This loudspeaker was developed in 1959 and consisted of 32 speakers (215 mm diameter) placed on a 70 cm ball. The weight of the whole construction was 150 kilograms. This ball was placed on a stand and able to rotate in all directions. The music played on this loudspeaker ball was not experimental at all, for example J. S. Bach’s St. Matthew Passion; nonetheless, I would love to experiment with these loudspeakers! The “Nullstrahler” in action during a meeting in Gravesano. A beautiful documentation of an exhibition on Herrmann Scherchen’s electroacoustic research has been made by Luca Frei. Bruno Spoerri wrote a detailed history on Scherchen’s studio in Gravesano (see the article Hermann Scherchen und das Experimentalstudio Gravesano (1954–1966) in the book Musik aus dem nichts). The loudspeaker was renovated at the Studio für Elektroakustische Musik der Akademie der Künste, and will appear in concert during the Kontakte Festival (28.09. – 1.10.2017). “Fünf Jahre Gravesano” (1954 – 1959) in: Gravesaner Blätter No. XIV Volume IV 1959 p. 2. Annea Lockwood’s loudspeaker ball also diffuses monophonic sound through many loudspeakers. And spherical and hemispherical loudspeakers have also been used by laptop orchestras, such as the Plork. The whole story is in my book “Musik aus dem Nichts” – and the thing is still around, but no more working. thank you very much for your comment and you are completely right, your article is a great source of information for this! I will mention it in the text above. I also heard, that apparently the loudspeaker has been renovated and is functioning again. New compositions are composed for it and it will be featured during the Kontakte Festival in Berlin at the Academie der Künste. I will try to get more information about this and update my post. I will be there at Kontakt 17, hope to see you. I am there as well, looking forward to seeing you there!